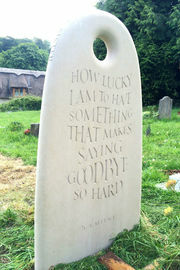 Please be inspired by these unique, hand carved headstones. All of our headstones are entirely hand made, therefore anything is possible. We chose a section of William Morris's Larkspur design to adorn this headstone. The background is simple cut away to achieve a very shallow relief. 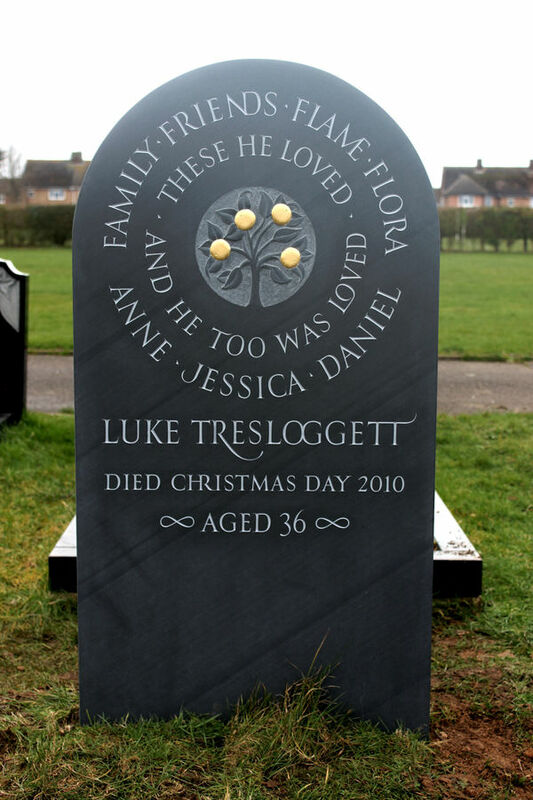 This is the back of the headstone; the front of which faces a tree. The back faces the path and guides the viewer in. The inscription is by John Donne. 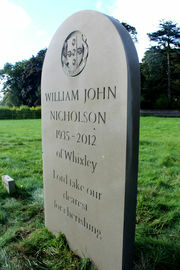 The carving on this headstone was inspired by William Morris. The only way we could find to lay out this inscription and put it in some sense of order was to have two concentric circles of text. Sometimes placing text in a circle beckons one to read it. The sideways 8â€™s mean eternity. 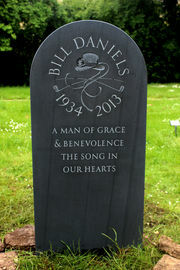 Bill Daniels was a celebrated Morris dancer. The crossed pipes, ribbons and hat with flowers are all segments from the outstanding Morris dancing group to which Bill belonged. One of the purposes of the pebble shape is to draw one in to touch it. I think this is important. Portland has a certain warmth to it and is noticeable immediately... polished granite will always feel cold! The quotation is from Winnie the Pooh. 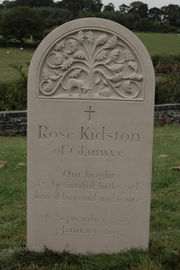 York stone needs deep, bold carving. This headstone is 4ft tall and so the lettering is robust and straightforward, not only making it very long lasting, but the letterforms have a very important timelessness. This is Cumbrian green slate and worked well partly due to its simplicity. The typographic ornament under the dates was put in to soften the whole design. This letterform is based on Caslon. 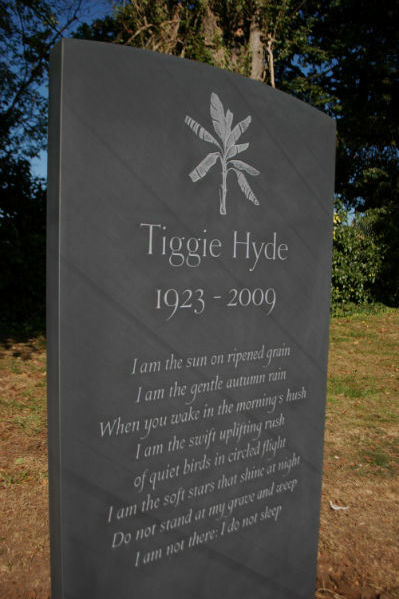 You can find more examples of green slate headstones in our blog. 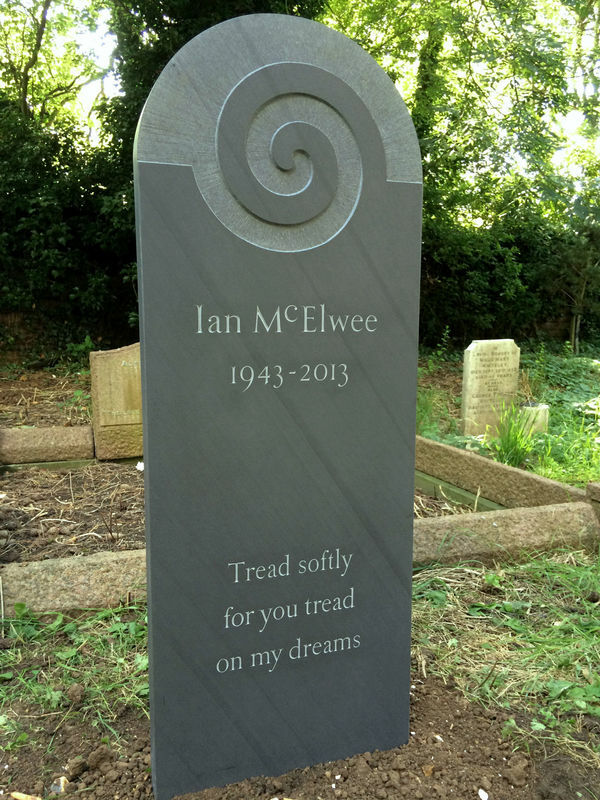 The spiral carving on this slate headstone is inspired by prehistoric carvings in Ireland. It was a tricky one to get right on slate, but it became very much its own thing. The headstone is fairly tall at 4ft, but narrow. It is in quite a dark area of the cemetery, but thanks to its striking appearance from a distance, it has a commanding presence over its surroundings. 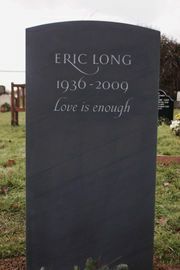 This simple slate gravestone is one of my favourite, a wonderful example of where "less is more". It speaks to everyone in only a few words. 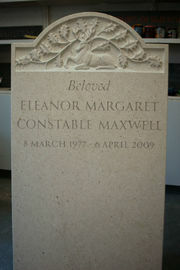 This fine headstone is carved in Oressina, which is hard Italian limestone similar to Hopton Wood limestone. I prefer this stone to Nabressina, which tends to chip. It lends itself to finer carving than Portland Limestone, so it is a good choice when a light coloured stone with detailed carving is wanted. This hand carved memorial in Cumbrian slate has a banana plant carved at the top in sunken relief. The plant is an indication of the birthplace, in this case Jamaica. This slate headstone has a relief carving of a kingfisher adapted from a painting by Christopher Bunn whom the stone commemorates. 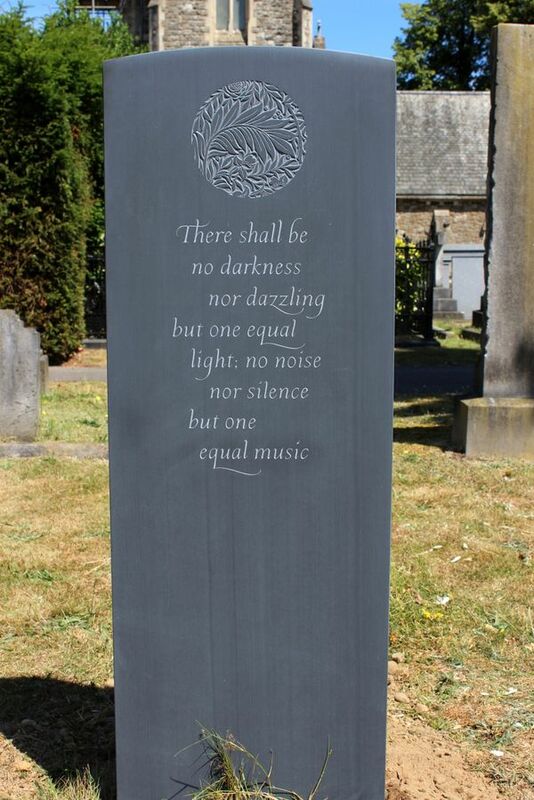 Nabressina is good alternative to Hopton Wood Stone, and lends itself to fine lettering and carving. 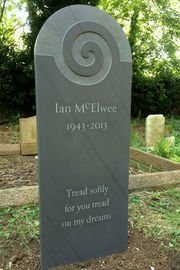 This headstone was designed in close collaboration with the client, who gave me some letters and asked for them to be incorporated into a motif carved in sunken relief. Children's headstones are always a special challenge. This headstone was made for a young child from Portland limestone. It has a fine relief carving at the top, with simple, quiet lettering. 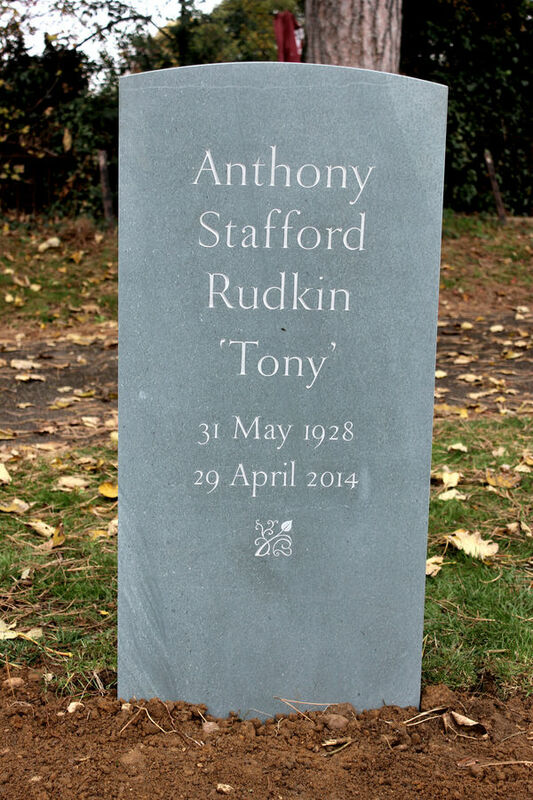 The headstone sits well in its beautiful surroundings. 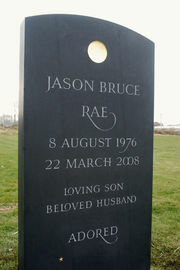 This slate headstone was made for Jason Rae the saxophonist. It was commissioned by his wife Corinne Bailey Rae and stands in a cemetery in Leeds. 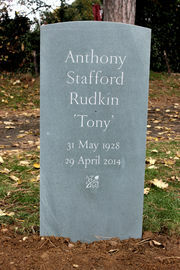 On the back of the headstone are a few bars of the song "Stardust". It was absolutely critical to get them right. 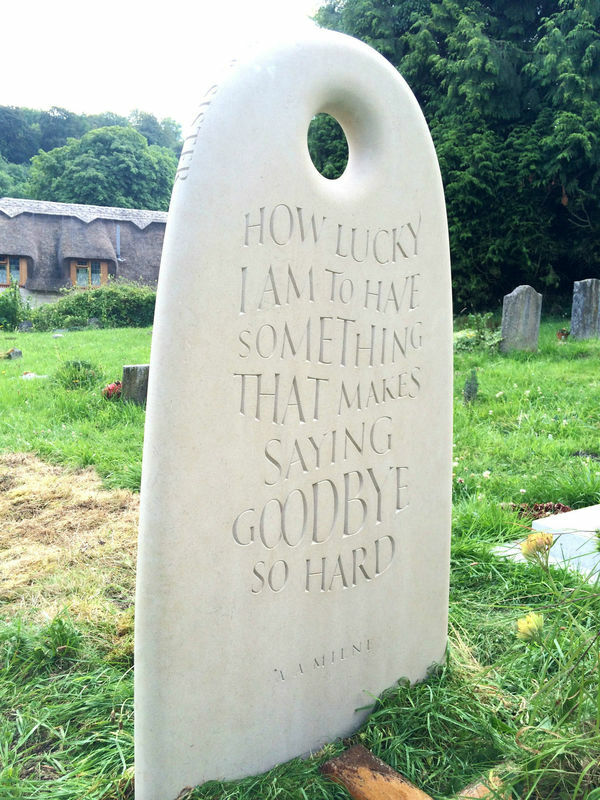 This traditional headstone in Hopton Wood limestone is quiet and graceful, reflecting the charm of the person it commemorates. The lettering here has been painted with a wash of colour to enhance the inscription. It is never glossy or too dark but always tasteful and just enough to serve the purpose. This beautiful Portland headstone has a carving along the top edge. The slightly raised top edge helps protect the carving from weathering. 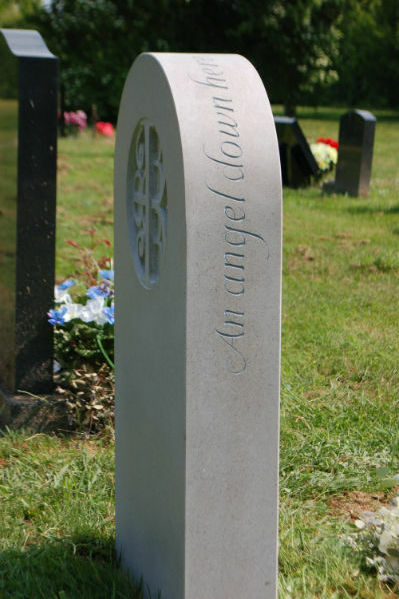 When one speaks of a hand carved headstone, it is important to remember that the carving process is only a stage in the making process. The headstones are designed by hand, masoned by hand, drawn out by hand and cut by hand. In fact the only item of machinery in the workshop is a dusty old radio. Why by hand? Because it is slow and precise. The stages are worked with great care. We have yet to be introduced to a machine capable not only of the great precision required, but possessing the ability to slightly distort a letter to improve the letter spacing. Hand carved lettering will always have life, energy and versatility. The quiet mallet and chisel are infinitely more precise than machinery and letter spacing and letterforms are judged by eye, not by computers or rulers. A letter cutter is both a craftsman and an artist; each piece of work produced in the workshop must be flawless, beautiful and unique. We have no catalogue with which clients choose a set or specific design. Almost anything is achievable. Size, materials and letterforms are not limiting factors except when it comes to abiding with cemetery regulations. For more articles containing advice and inspiration on choosing a headstone please visit our headstone guide. 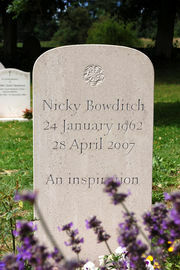 Many of our headstones are very traditional and sit very well in our British Churchyards. At the same time some of our more contemporary headstones are still made in the traditional manner under direct influence of masters such as Eric Gill and Richard Kinderlsey. I have compiled a list of epitaphs and helpful articles to help you choose the right words. We were delighted with my father’s headstone - beautifully done in line with what we asked for and with a few perfect flourishes, which is just what my father would have loved! Our preparatory discussions with Fergus were very reassuring, and it was fascinating to visit his studio and see work in progress. And now the finished headstone sits perfectly among other family headstones. We would definitely recommend Stoneletters to anyone who wants stone lettering of a really high standard - thank you Fergus.